Just curious in Lightroom what Camera Calibration setting do people use with their Nikon Camera's (D800 & D700) for portraits. Does anyone use VIVID for portraits? I am a Canon and Fuji shooter, but I can assure you vivid would be a tad too "Vivid" for portraits. (Pun intended) I can tell you that Nikon is usually a tad "warmer" in the skin tones, so I can only imagine vivid would be too much. If using Lightroom, use camera neutral and adjust from there. Even though I am a Canon shooter, I process D750 files all the time for a friend. 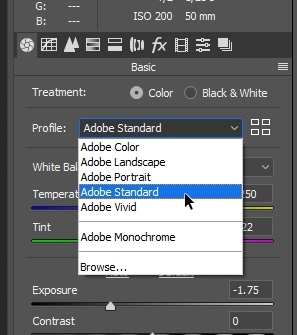 I usually use adobe standard or neutral too adjust. I hope that helps. Have a read of THIS I posted a long time back, all to do with Camera Profiles on my Nikons and Camera Process I use (2010 instead of 2012+). I use Vivid, but you need to understand what Adobe does in the background with their Default Tonal Curves, you need to change it so make sure you read the first post carefully. I can't find in LR the location of the setting you are talking about. More curiosity than anything else. 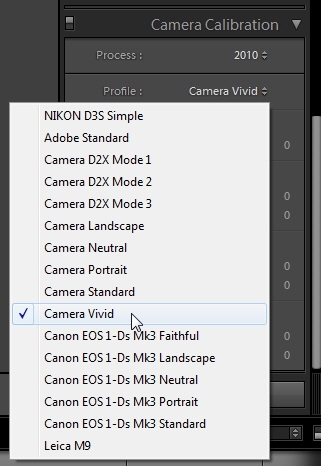 Sorry guys, you won't find 'Camera VIVID' in your Profile choices unless you are using Nikon. What you see is supposed to be the camera manufacturer's 'Camera Profiles' for each make of camera, but you cannot really choose anything else unless you find/load profiles from other places (too long to explain here, Dr. Google is your friend). See attached screen shots, (I have Canon RAWs on my system so was able to use one of them) and of course what I shoot with Nikon, no other RAW files. Now, the shot of my 'Nikon' choices shows a lot more than normally available because I've played around with some Profiles, and added them to LR. You could try doing that, but I still found Camera Vivid to match what I see on back of LCD as shown in that article I posted. However, I've gone away from LR altogether now for Nikon files, only using it when my mate who second shoots with me at weddings uses his Canon which I have to then use LR, and even then I cannot get it to match my great colour unless I actually use Camera Landscape and drop the 'Blues' back around -3 in a preset under Hue/Saturation Tab (I think). I now use Nikon's ND-X, a bloody superb piece of software now since it's been upgraded dramatically and because it's Nikon based, it 'reads' precisely the Picture Control/Style you've programmed in, *everything* including the great sharpness, contrast, exposure, WB, etc., etc., and you can still change in the program anyway, not set and baked in even in RAW once it's out of Nikon's control like ACR/LR/Bridge, where sharpness especially is 'out the window' in my books. Upload a file to Dropbox or other filesharing site, send me a PM with link so I can download and take a quick look as I know I've opened Fuji files before and think you have choices anyway, do some tests mate, make some fine tune adjustments (just not your Exposure/White Balance, leave those for later) and when you then make a preset, import your files using that preset so it's across the board, then do your normal adjustments per image. Dave, I just re-read your post, do you mean the 'location' of the TAB where the settings are, or do you mean you cannot 'see' Camera Vivid in your Profiles? 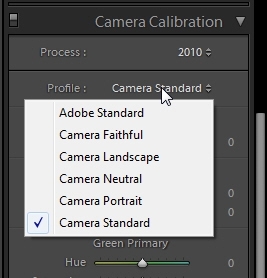 It's location in the TAB called Camera Calibration where you can change the 'Process' and 'Camera Profiles' as seen in screenshots above. Got it thanks, I've opened in ACR and the only profiles are as you would have seen (because it's a DNG file) are 'Adobe.....' ranges. I've edited the file, but won't post here. I uploaded to dropbox and gave you a link mate, but in a Private Message from this forum. I used Adobe Standard, dropped the exposure back to -1.75 e/v (1 and 3/4qtrs) to bring face back it was over a bit so I could then get good shadows then opened in Photoshop and did the rest of editing in there, Contrast, Sharpening, etc. Got the RAW file mate and not the DNG this time, but it has the same profiles available anyway which I thought odd, but since I don't work in DNG I guess it's embedded that way when coverted by retaining the options of the RAW. Anyway, since it's identical, I won't bother doing an edit, pointless as result will be the same. trev. you have to go to browes in the profile menu to found the camera matching profile that fuji uses if you dident know that.. I did mate, I get the exact same option as I posted above, and not being a DNG user, I presume now that I've seen the actual RAF file, it still shows the same so to me that means the DNG conversion retained the profiles the RAF uses, no other options except as above.